Why do I look worried? I haven’t the foggiest idea. The debate over Frankie Montas’ Dodger future began the day he arrived: starter or reliever. 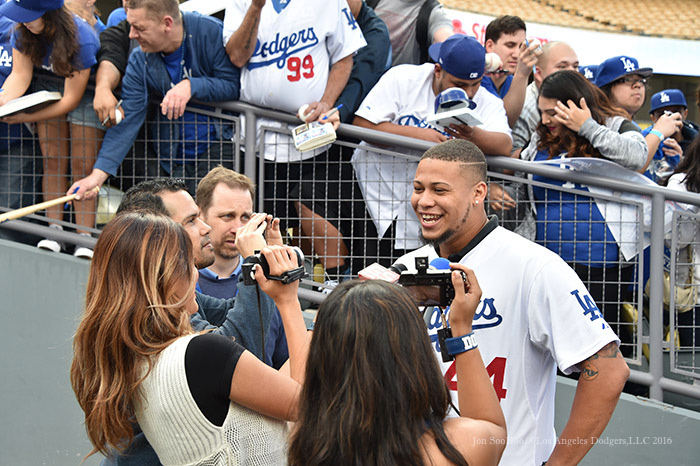 A nice overview of Dodger FanFest by our crack production team above, along with some words from manager Dave Roberts and Clayton Kershaw below. 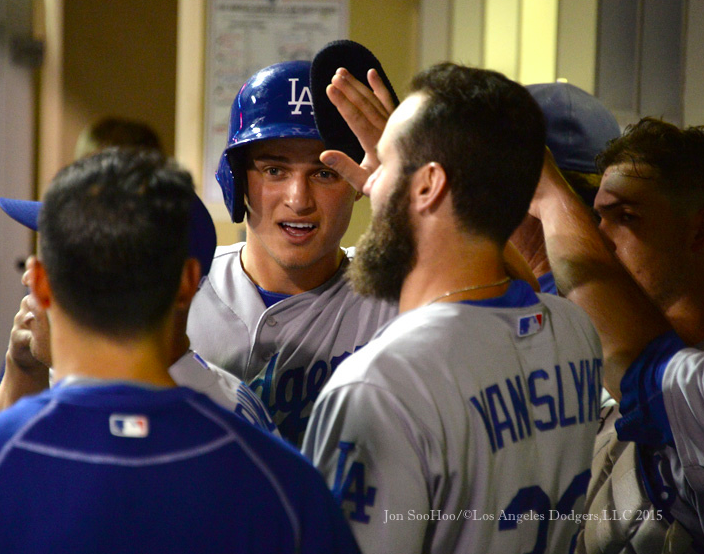 (Plus, here’s a link to Jon SooHoo’s photos of the day at LA Photog Blog. Three-and-a-half months after Dodgers head team physician Dr. Neal ElAttrache performed surgery on Yasmani Grandal and Justin Turner, both players are moving forward physically and optimistic about being in the Dodger lineup on Opening Day, April 4. In just under the wire before an expected Sunday rainstorm, it was a whale of a day at Dodgers FanFest (presented by State Farm), with activities and athletes galore. 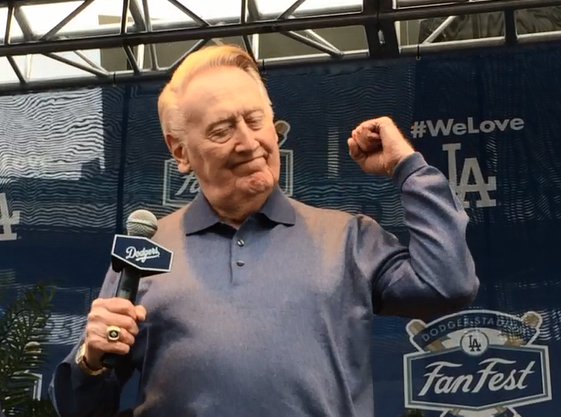 As usual, no one set the tone better than Vin Scully, who took the FanFest stage and told the story above. Corey Seager has unseated Byron Buxton as baseball’s top prospect. MLB Pipeline ranks the Dodger shortstop at No. 1. The announcement was made on MLB Network on its Top 50 Prospects show Friday night. Buxton was Pipeline’s No. 1 prospect in 2014 and 2015. Prior to that, Texas’ Jurickson Profar was the top guy in 2013 and Tampa Bay’s Matt Moore topped the list in 2012. MLB.com’s prospect and draft branch also released its entire top 100 Prospects list, and five Dodger minor leaguers made it. Left-hander Julio Urias jumped from last year’s No. 8 to 4. Right-hander Jose De Leon, who wasn’t on the list in 2015, ranked 24th. Dodgers 2014 first-rounder and 19-year-old righty Grant Holmes jumped 33 spots to 62. Hard-throwing Frankie Montas, who was the 91st-ranked prospect last year in the Chicago White Sox organization, slotted in at 95 this year. Over the last 10 days, Pipeline has ranked the top prospects at every position and two Dodgers who didn’t make the top 100 still were rated as top 10 players at their position in the minors — Cody Bellinger was the No. 6 first baseman and Micah Johnson was the No. 7 second baseman. Baseball Prospectus also had Seager as its top prospect in its list of 101 players. Urias ranked sixth with BP, followed by De Leon at 28, Holmes at 40, 19-year-old Cuban right-hander Yadier Alvarez and ranked 78th and 19-year-old Cuban outfielder Yusniel Diaz was 91st. This week of the Dodgers Love L.A. tour (presented by Bank of America) is all about the community … almost. There’s one other tiny aspect of it, largely unnoticed and not all that important, but meaningful just the same. 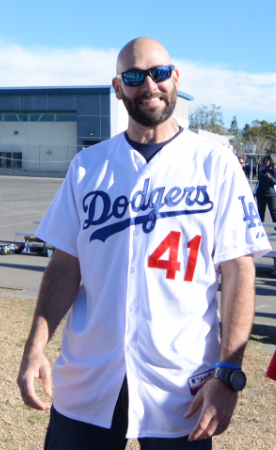 For the first time in the new year, a Dodger player puts on his uniform. That moment, just a few days before Punxsutawney Phil reveals himself, turns on the pilot light for the coming season. Putting on the Dodger whites today was particularly special for some players, such as 24-year-old right-hander Jharel Cotton, who did so for the first time as an official Major League member of the 40-man roster. Added to the thrill for Cotton was getting the opportunity to hang with his teammates, before the season starts. If this was admittedly just one moment in time for Hatcher, Cotton and the Dodgers, it was a moment of a lifetime for the people they met, including those members of the Wounded Warriors Project who previously wore uniforms of an entirely different kind. Sporting an Andre Ethier jersey, East Los Angeles native Jonathan Nunez was effusive about the lunch he shared with the Dodgers at City Hall, after joining the team in attending today’s Vin Scully Avenue vote. Nunez has been involved with Wounded Warriors for six months, as he aims to overcome post-traumatic stress disorder after serving separate tours for the Marine Corps in Afghanistan and Iraq. And at the end of the day, meeting men and women like Nunez is what meant the most to Hatcher. Ultimately, when the big moment came, it came in an instant. 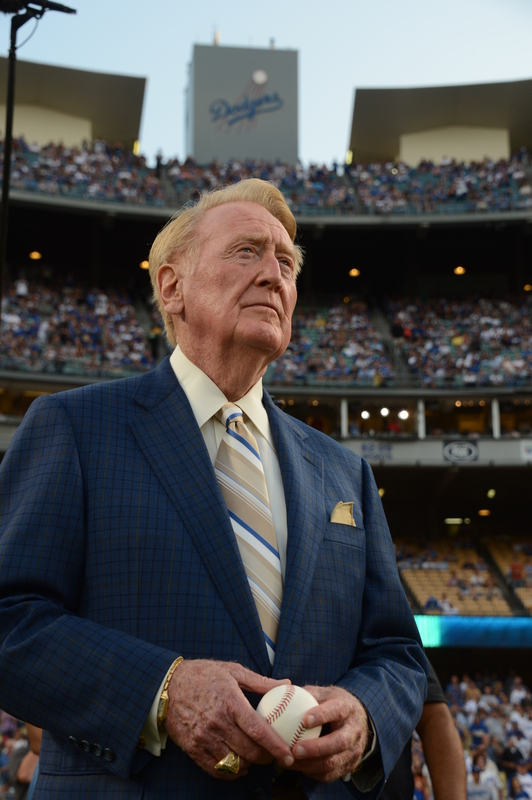 By a 12-0 vote, the Los Angeles City Council approves a motion to change the name of Elysian Park Avenue to Vin Scully Avenue. Then, we are silent, because as we have been taught, there are times when it just makes the best sense to let the crowd speak for itself. @Dodgers hooray! A great honor for a great man! @Dodgers Listening to Vin Scully call a game is like poetry, each game a poem, an epic ode to baseball. Greatly deserved. When we return, we simply hear these words. And like that, Vin Scully has touched home, just as he has touched our souls. Forever. Within 30 days, given the expected blessing of local residents, the existing street signs will be lowered and new ones raised. 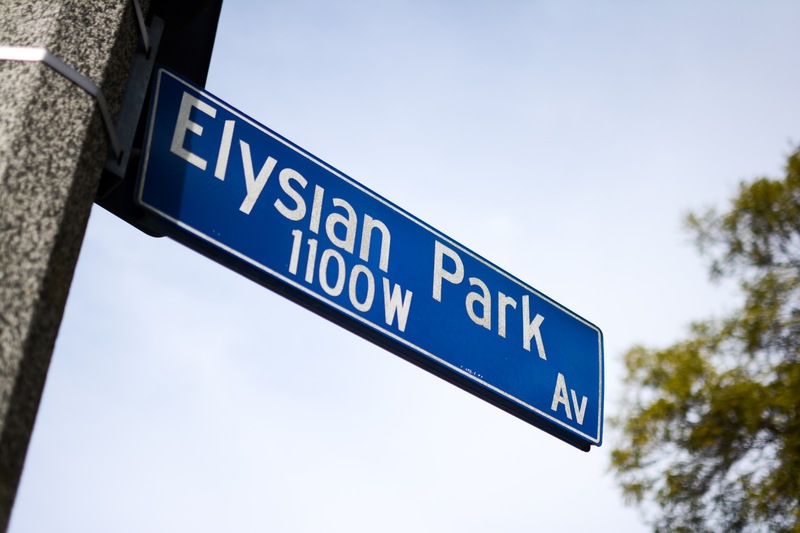 I’ll say this much, and don’t misunderstand this as opposition to today’s events: I love the words “Elysian Park.” They’re a melody in four beats, and their long association with my home away from home evokes a Proustian sensation. It had to be something special, something transcendent, to justify replacing them as the address of Blue Heaven on Earth. Vin Scully Avenue meets that standard. One small street for Vin, one giant drive for fankind. No name could be more worthy, except perhaps, as one citizen (a fellow Fordham grad, he told us) argued during his opportunity at City Hall for public comment, Jackie Robinson. But the groundbreaking Dodger is getting Dodger Stadium’s inaugural statue — no small honor, that. I don’t feel Robinson has been done a disservice, and I do think it was worth showing Scully how much he has meant to all of us. “I’d be okay if we named the whole damn city after him,” councilman Paul Koretz exulted. And who could argue? 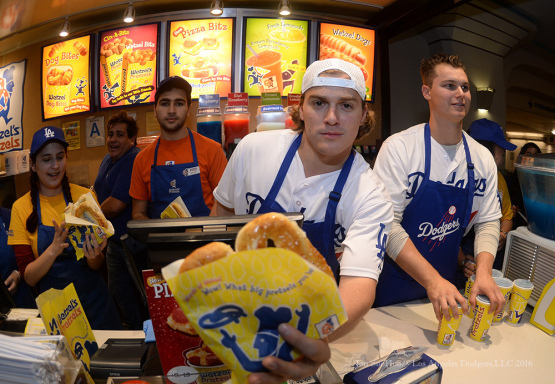 Day 4 of the Dodgers Love L.A. Community Tour (presented by Bank of America) was comfortably comestible, with Dodgers Kiké Hernandez, Yasiel Puig, Joc Pederson and Justin Turner giving away Dodger dogs and pretzels in downtown Los Angeles. 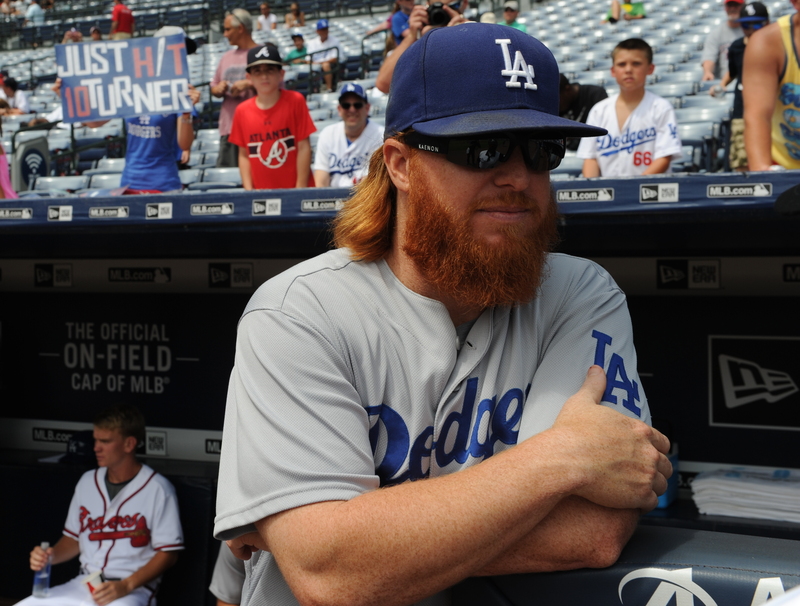 Pretzel man Justin Turner, by the way, was just labeled the fifth-best third baseman in MLB right now, by MLB Network. While there, Pederson spoke to MLB.com about Dave Roberts and the upcoming season. For more images from the day, visit LA Photo Blog. Earlier in the day, Presidential Ambassador for Citizenship and Naturalization (and, oh yeah, Dodger legend) Fernando Valenzuela was on a White House conference call to discuss the launch of the White House Regional Convenings on New Americans, aimed at assisting local immigrant and refugee efforts. The Dodgers Love L.A. Tour heads to City Hall this morning, to see if Vin Scully Avenue becomes officially official. 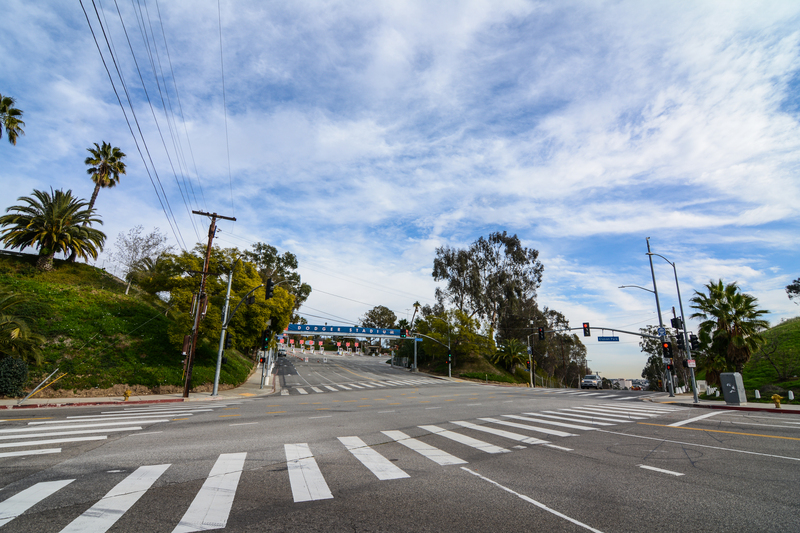 Gateway to Dodger Stadium: Vin Scully Avenue? Who’s ready for Vin Scully Avenue? 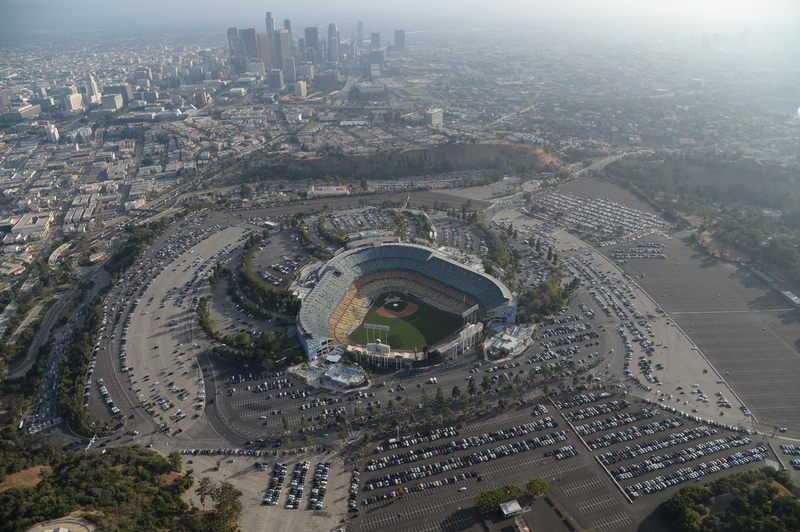 That could soon be the name for the stretch of road leading from Sunset Boulevard to Dodger Stadium. Los Angeles city councilman Gil Cedillo is scheduled to make a motion for a vote during the Friday City Council meeting at City Hall to change the name of Elysian Park Avenue to Vin Scully Avenue, in honor of the Dodgers’ Hall of Fame broadcaster. 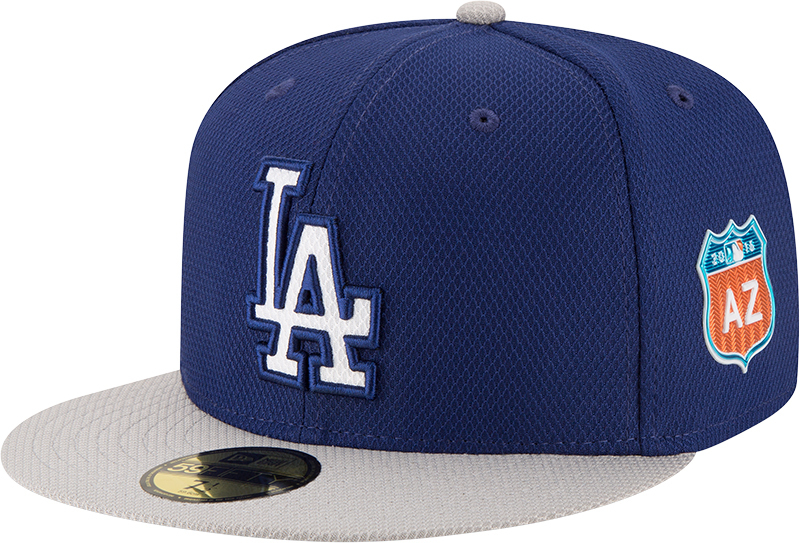 Many members of the Dodger organization will be present Friday at City Hall, as part of the Dodgers Love L.A. Tour (presented by Bank of America). Scheduled to attend are Dave Roberts, Clayton Kershaw, Yasiel Puig, Austin Barnes, Jharel Cotton, Carlos Frias, Yimi Garcia, Chris Hatcher, Pedro Baez, Yasmani Grandal, Micah Johnson, Zach Lee, Adam Liberatore, Frankie Montas, Josh Ravin, Scott Van Slyke, Trayce Thompson and Ross Stripling, along with Dodger alumni Tommy Lasorda, Orel Hershiser, Ron Cey, Steve Garvey, Eric Karros, Maury Wills and SportsNet LA broadcaster Alanna Rizzo. In the spring, they’ll wear a third. 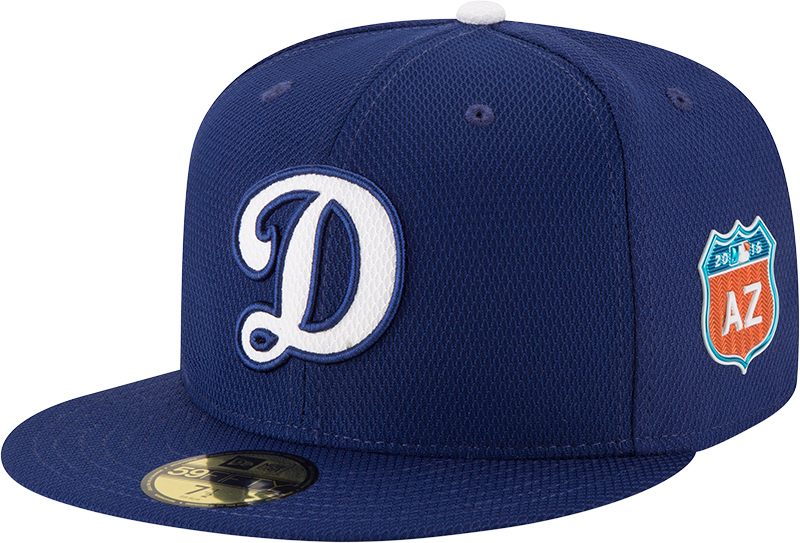 The Dodgers will wear a lightweight cap with a cursive capital “D” logo — the same “D” from the Dodger script on their jersey — during selected Spring Training games. The LA logo will be retained for other games. This is part of Major League Baseball’s rolling out of new Spring Training uniforms and caps for every team. The jerseys are part of Majestic’s new Flex Base uniform system, which features a lighter-weight jersey. The jerseys will also be worn throughout the postseason. The Spring Training jerseys will have a highway sign on the sleeve with state initials for Arizona or Florida, representing each team’s preseason home. In the Dodgers’ case, that will be Arizona. 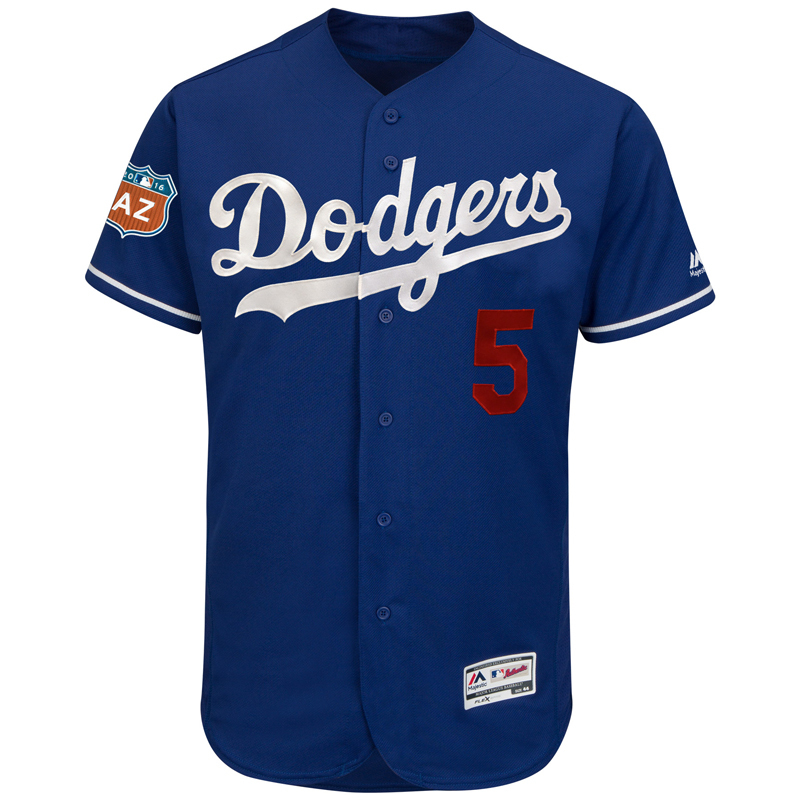 The names and numbers on the backs of all jerseys will feature a sublimated Spring Training design pattern featuring Spring Training marks and the silhouetted batter logo. The same designs will also be on the inside of the caps’ crowns. The highway sign will also be featured on the left side panel of the cap. The right panel will have an embossed National or American League logo.